Renault are creeping closer to bringing Fernando Alonso back into the fold for 2008, Flavio Briatore now putting the odds at 60%. And, linked to that, is the likelihood that Nelson Piquet Jnr will be in the second car. Now there's a prospect that fills one with joy! Nelsinho would take the drive since he is so desperate to break into F1, but how he takes to being a definite number two is another matter entirely. From his statements so far, it is pretty clear that the young Brazilian has a high opinion of himself and I cannot see that attitude sitting well with the volatile Alonso. If he is not careful, old Flavio is going to have problems reminiscent of McLaren's this year. The spy case due to be heard in early December might just be the beginning of Renault's taking on the McLaren mantle. No doubt it will be made very clear to Piquet that the drive is given on condition that he accepts second class status in the coming season. And that could lead to a couple of scenarios, both of them not very pleasant for Renault. Either Piquet will do as he's told dutifully and allow his potential and reputation to be stunted by his apparent inability to beat Alonso, or he will get carried away when leading the ex-champ and ignore team orders (well, the team orders that don't happen because they're illegal). We all know what happens when Alonso gets beaten. I wish Flavio the best of luck if he has to sort that one out. It might never happen, of course. Red Bull remain in the frame for taking on Alonso, in spite of Mark Webber's dismissal of the possibility, and Toyota has suddenly popped up again as a potential employer. Round and round goes the speculation, to the point where I, for one, become thoroughly bored with the whole thing. At times I find myself wishing that I was a team owner so that I could say, "Sorry, Alonso, we're not interested. We're bringing Scott Speed back from the States because he's likely to be less trouble..."
As much as I don't like it, the plain fact is that Alonso dominates the driver market in the same way that Michael Schumacher used to. Everyone has to wait to see where he decides to go before they know their seats are safe, whether or not they have contracts. And that is a good indication of how the drivers are rated amongst team owners; obviously, Fernando is number one on their lists. I wonder if he is worth it. The famous six tenths that he brings with him (an estimate originating not with Fernando himself but with his former boss, Briatore) is apparently accepted as fact, no matter how much we may question it. But is he the only driver who can get more from the car than other top notch drivers? I doubt it. Both Raikkonen and Hamilton would probably give you as much purely from driving talent; Button and Rosberg could perhaps extract the same from the car too. And there may be others just waiting their chance to prove how good they can be in the right team - Adrian Sutil springs to mind at this point. We are in a transition period from the days of Schumacher supremacy. Alonso stands out as being, with Raikkonen, the only known and recognized top class driver in the sport. Next year we will see and understand more and it may well be that the Spaniard has plenty of competition by the time the season ends. He might be advised to take Renault's three-year contract and forget the unlikely prospect of driving for Ferrari in 2009. For the moment, however, we are stuck with the constant stream of Alonso rumors and F1 holding its breath while it awaits his decision. It may be an amusing game to imagine him in different teams and with unlikely team mates, but it becomes boring in the end. I am at the point now where I couldn't care less where he goes - just go, Fernando, go! I think he enjoys all this attention and is trying to stretch this out as much as possible. In the end I don't think he can wait for Renault to figure out their legal issues. I think he heads to RBR at Webber's expense. They were very strong at the end of the year and Alonso would certainly be faster then DC. That's my bet too, Dan - Alonso to RBR. And definitely Alonso laps up all the fuss and attention over his decision. He probably knew where he would be going before he left McLaren! I think the driver market would be different if Hamilton or Raikkonen were available. I think Lewis would be a hotter property than Fernando. I always believed that Alonso would end up at Renault until the FIA decided to look into their spying issues. Bet Max wishes he had ignored the McLaren issue now. Alonso and Piquet is probably the most explosive combination that Flavio could put together. It is all weel and good having team orders in the race but if Piquet is qualifying faster Alonso will get upset. And of course the master when it comes to winding people up is daddy Piquet. I bet he can't believe his luck. It's true that Raikkonen and Hamilton not being on the market concentrates all the attention on Alonso. He does have the advantage of being a fully known quantity over Lewis, however. And, even though everyone was pleased that Kimi finally got his championship, I don't think they're all convinced that he can set the car up anything like as well as Alonso does. So Alonso would still have a slight edge in the driver's market, even were the other two involved. I almost wish the Alonso/Piquet pairing would happen - it would be so entertaining to watch the fireworks! yes, the Piquet / Alonso pairing is what does not smell exactly right ... a year ago Hamilton and Piquet were pretty much even in GP2. Does anybody blame Massa for not being able to win the Brazilian GP ? No one blames Massa, Milos, but it affects their view of him inevitably. Consider how Barrichello became known as a number two driver during his years at Ferrari. There were times when he was quicker than Schumacher but still the stigma remained - Rubens accepted second. And Piquet runs the risk of the same happening to him as the support driver to Alonso. I don't think Piquet Jr. has the temperament to accept No. 2 status to anybody, even if Alonso is a double world champion. As a result, if they ever find themselves on the same team, they'll fight each other in the same way that Alonso and Hamilton fought. I'd go so far as to say it'll happen even if Alonso wipes the floor with Piquet Jr. on track. I have a feeling that if this goes ahead, Flavio Briatore may find himself wishing he'd kept Fisichella, if only to keep Alonso from exploding too often. My feelings exactly, Alianora. Fizzy was really the perfect team mate for Alonso - no real threat but quick enough for back up if needed. And Piquet is no Fizzy! The thing is, as much as Alonso dominates the drivers market, he really doesn't have that many choices. Having been a world champion twice and almost losing to a rookie, nothing shorter of third title would do him any good. That's why he leaves McLaren, as the team is relegated to the back of the grid with limited space and an obvious pit stop disadvantage, only a miracle will see them get ahead of Ferrari. In my opinion, Alonso in Renault '08 is unlikely to be repeat '05 and '06. 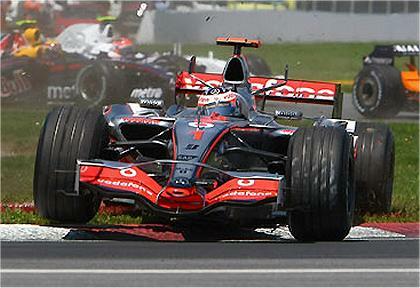 As talented as he is, 2007 might well be the last time Alonso had a legitimate shot at the world title. Good points all, Bharath. He has a very difficult choice to make and none of the answers may be correct. I suppose his best bet would be Renault but, like you, I don't believe they will be title challengers next year. Maybe he should take a chance on Red Bull, if he can get it. My friend Clive has done it again..........truer words are rarely spoken: "Fizzy - no real threat but quick enough for back up if needed. " Ah, yes. Often the #2 man is TOTALLY ignored, the entire world is ready to throw Fisi overboard but it was Fisi and his dismal 3rds and 4ths that earned enough points to secure the CONSTRUCTORS championship for Renault. Do you suppose old Flav ever said "thanks"? Another name I hear disparaged occassionally is Massa but may I remind everyone it was he and he alone that won the DRIVERS championship for Kimi. If Massa was anywhere but second place at Brazil Kimi would still be a bride's maid! And more good qoutes from Clive: "And Piquet is no Fizzy!" That's right, Fisichella is an experienced points earning team player, Piquet is just another snotty wannabee. He needs more mileage in his logbook before I'd let him drive one of my cars! A good number two driver is a valuable asset in F1 and pretty rare - the last that I can think of is Patrese. But both Fisichella and Coulthard are easily capable of fulfilling that thankless task, although I doubt that team managers will see that. I'd let Nelsinho have a drive in my team, Number 38 - but only in memory and thanks to his father!